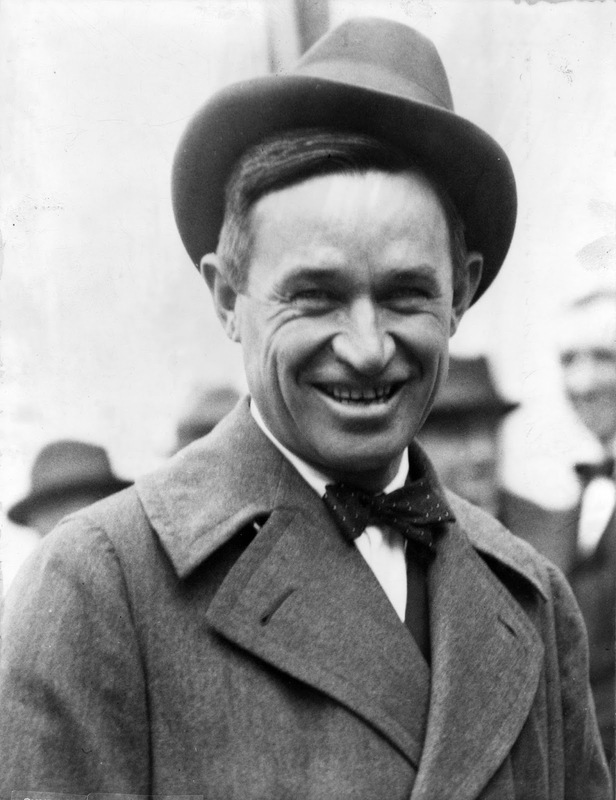 Will Rogers was first an Indian, a cowboy and a national figure. Born in 1879 on a large ranch in the Cherokee Nation near what later would become Oologah, Oklahoma, Will Rogers was taught by a freed slave how to use a lasso as a tool to work Texas Longhorn cattle on the family ranch. One rope caught the running horse's neck, the other would hoop around the rider and the third swooped up under the horse to loop all four legs. Will Rogers' unsurpassed lariat feats were recorded in the classic movie, "The Ropin' Fool." His hard-earned skills won him jobs trick roping in wild west shows and on the vaudeville stages where, soon, he started telling small jokes. Quickly, his wise cracks and folksy observations became more prized by audiences than his expert roping. He became recognized as being a very informed and smart philosopher--telling the truth in very simple words so that everyone could understand. After the 10th grade, Will Rogers dropped out of school to become a cowboy in a cattle drive. He always regretted that he didn't finish school, but he made sure that he never stopped learning--reading, thinking and talking to smart people. His hard work paid off. Inside himself, Will Rogers remained a simple Oklahoma cowboy. "I never met a man I didn't like," was his credo of genuine love and respect for humanity and all people everywhere. He gave his own money to disaster victims and raised thousands for the Red Cross and Salvation Army. At home, either on his ranch in Oklahoma or California, he always enjoyed riding horseback, roping steers or playing polo. He would scratch his head, grin and quip that he figured there was something wrong with anybody that didn't like a horse. Jim Rogers, 1915-2000, after starring in some cowboy movies as a young man, spent his life as a horse and cattle rancher. Betty and Will Rogers's youngest son, Fred, died of diphtheria when he was two. There were eight children born to Will Rogers' parents, but only four reached adulthood on the rugged frontier of 19th Century Indian Territory. If there are no dogs in Heaven, then when I die I want to go where they went. Even if you are on the right track, you’ll get run over if you just sit there. Strangers are just friends I haven't met yet. Be thankful we're not getting all the government we're paying for. The only way to beat the lawyers is to die with nothing. Mona Lisa is the only beauty who went through history and retained her reputation. Things will get better - despite our efforts to improve them. I bet after seeing us, George Washington would sue us for calling him "father." Good judgment comes from experience, and a lot of that comes from bad judgment.